Minimize the Impact of Gender Dynamics! 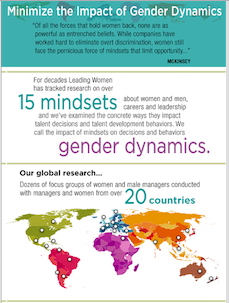 Leading Women has conducted ground-breaking research about gender dynamics around the globe - and the findings are essential if your workforce is global. Wonder what we've discovered and how it can help shape your initiatives to close the leadership gender gap? Submit the contact form and you'll be redirected to a page where you can download the complete infographic. Success criteria for gender dynamics education.